Sure, it snowed six inches yesterday, but it’s March, so spring can’t be far away, and that means more time riding our bikes! There are a few local upcoming bike-related events that you should know about. The Chicago Bike Swap will be held on Saturday, March 9 from 10:00 am to 5:00 pm on the UIC campus. Although you can indeed go there to try to sell your ride or look for a new one, there’s a lot more to this event than swapping bikes. The organizers (including Active Transportation Alliance) should consider renaming it to the Chicago Bike Expo or something similar, because there will be 75+ vendors and services present as well as numerous mini-seminars or demonstrations. One that will be of interest to parents or parents-to-be is the cargo bike area, in which you can look at bikes that are made to carry children (or other precious cargo), as well as talk to the owners and even try riding one. At 11:30, Chicago parents with lots of experience bicycling with children in tow will give a talk called “Kids in the Saddle”. Beyond that, there will be a bike polo demonstration area, which sounds fun to watch, and at 3:00 pm, a seminar on how to avoid being the victim of bike theft. This event is very popular and they expect thousands of attendees. Go to the event website for full details. The next meeting of the Mayor’s Bicycle Advisory Council is Wednesday, March 13 in City Hall. This council is led by Chicago Department of Transportation staff members, and the council is comprised of various municipal stakeholders and community members (I am one of three community reps on the council). Members of the public are welcomed and encouraged to attend. You can view minutes from past meetings at this link to get an idea of the content of the meetings, but generally CDOT provides updates and news, and there is ample opportunity for the community and anyone in attendance to ask questions. If you aren’t able to attend, there is generally good coverage provided on Streetsblog Chicago (formerly Grid Chicago) after the meeting. Wednesday, March 13, 2013, 3:00 p.m. - 4:30 p.m.
Did you know that less than 30% of the people riding bicycles in Chicago are women? It would be great if we could increase that number, and this event might help. 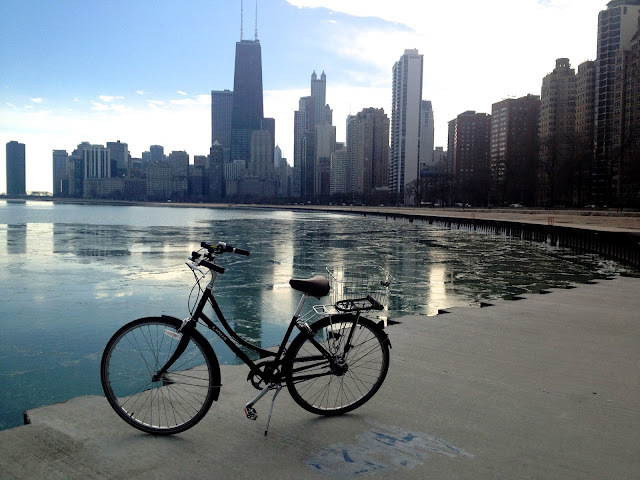 A consortium of groups, including Cycling Sisters and Women Bike Chicago, will hold a free event on Saturday, March 23 from 9:00 am to 1:00 pm, covering all things related to women and bicycling. The event is called "Women Biking in Chicago: a Day of Dialogue and Demonstrations". Ladies only invited! This event is not only for women who already ride, but also those who might want to but have held back, so if you know someone who is in that large category of “interested but concerned”, bring her along so she can get tips and inspiration. There will be a discussion about getting back in the saddle after a long period of non-biking, tips on managing children and bicycling, and hands on demonstrations of how to do a basic safety check and how to clean and lube a bike, and much more. Get more the details via this event notice on Chainlink and get your free tickets (and more information) on Eventbrite. Follow them on Twitter @wbikechi and "Like" their Facebook page while you're at it. Follow Bike Walk Lincoln Park on Twitter @BikeWalkLP! Michelle, Thanks for your post about our event. I would like to add that this event is being put on only by women. All presentations, cycling safety skills, basic maintenance, how to buy a bike and what to do when you go to the bike shop--all from a woman's perspective. We are getting a great response. Looking forward to seeing you there. On my daily commute I notice at least %50 more women than men. Lisa, thanks for the additional info and I look forward to the event!